What is the best accounting program for the DIY property investor. Let me share the best program, how I use it and some pro tips for managing property finances. 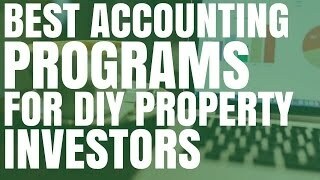 What are the best accounting programs for the DIY property investor? Hey, I’m Ryan from onproperty.com.au, helping you find positive cash flow properties. One of the really important things that you need to do when you’re investing in property, when you own properties is you need to actually manage the finances of those properties. So you need to keep track of income coming in. You need to keep track of expenses going out. And you need to collate those at the end of the year and give them to your accountant so they can go ahead and do your tax return. So what are some of the best accounting programs out there for the DIY investor? Now, I’m going to show you the program that I recommend, which you can all have access to really easily. But before I do, I want to give you a pro tip that I got from Ben the buyer’s agent. Ben from Pumped on Property, who recommended – and he does this himself – is that he gets the rental mangers to do a lot of his financial stuff for him. So, obviously, he collect the rents, but he also gets them to pay his insurances, gets them to pay the council rates, the water rates, all of that sort of stuff as well. He works very closely with the real estate agents in order to get them to manage most of his finances for him. I haven’t specifically asked him, but I imagine a portion of that would be collating and sharing the receipts and stuff with him so that would be really easy to keep track of that sort of stuff. So, definitely a pro tip, is to go out there and to ask your rental manger if they can go ahead and manage this sort of stuff for you. Ben has said that of all the people that he’s asked, no one’s ever said “no” to him. So, it’s definitely something that you should explore. Now, the first program that I’m going to recommend and I will recommend a couple, is a program that we all know and only a few of us love. And that is called Excel. Here, I’m using Google Sheets, which I think is way better than Excel because it’s just simpler, it’s free, it exists online so you can access it from any computer and it just works. What I’ve got here is an example spreadsheet that has every day in the year. Now, this one is a bit old. I think it’s from the financial year 2015-16. So I just took my old business one and basically cleared it of its data. Probably should have taken from 2016-17, but regardless, the process is still the same. Actually, I can just go ahead and change this date. Let’s make this the 1st of July 2016 and that’s going to update all the dates. So now it is correct. Alright. So, basically, what I have here is every single day of the year goes along the spreadsheet. This makes it quite a large spreadsheet, but that’s fine because we’re just looking at the days. When I have income come in, so let’s say I have rent come in on Wednesdays, that’s $350. I can go ahead and put that in. On the next Wednesday, I could again go $350 and I can do that for my rents. What I would ideally do, you could call this “Property 1” or you could have one of these sheets for each individual property. So you’ve got every day of the week, but then you’ve also got an annual summary here, which is what you’re going to provide your accountant – what your accountant is going to be most interested in. So you could do “Property 1”, “Property 2”. If I was doing it, I’d probably have one of these sheets per property. So let’s just call this “Rental Income”. You may also have things like “Interest on Savings” or some other form of income, but chances are, you’re not going to need this many so we can go ahead and delete those rows. At the top, you put all your income. And then, you go ahead and put all your expenses. So I’ve got – these are all business expenses of mine so let’s go ahead and delete those. For expenses, for example, you’ve got your “Rental Management Fees”. You’ve got things like “Council Rates”. You might have “Strata Fees”. You’ve got “Insurances”, all of this sort of stuff. And so, basically, what you do is when you pay one of those things, go ahead and put it in this spreadsheet. So let’s say I paid council rates of $2,000 for the year or something like that. I would go ahead and put that down. That will then add to the summary, etcetera. You would also need a separate way to store all of these documents, which I’ll talk about in a minute. Basically, you can go through this. I’ve also got phantom expenses down that bottom here, which, again, are expenses like depreciation. So, you’re not actually paying for these, but you might have, for example, $5,000 of depreciation on your property. So that goes towards your profit and loss for the year for the property, but it hasn’t actually come out of your pocket. That’s why I give its own little section. So, at the end of the year, you collate all of those. You’ll have income by category. You’ll have expenses by category. You’ll have phantom expenses as well. You will then have totals, which you can then go ahead and provide to your accountant. So that’s a really easy way to do it. There’s a lot of programs and stuff out there to make it easier than Excel. But really, I find this really simple and I don’t know why more people don’t do this. If you’re not an Excel guy or gal, let’s say you just don’t like tracking finances at all, I would recommend a site called My Property Tracker. Now, if we go to their pricing page, I really love this automated plan. They do the data entry for you so whenever you get an income receipt, whenever you get an expense receipt, you email it to them and they will then log it for you. This is great because if you’re not sure whether or not you can actually claim something, you can email the receipt to them, ask them, “Can I claim this?” and they will then assess it because they have a team of experts who know these things and who can assess them. So, that’s a really cool thing. Again, just go to onproperty.com/tracker, which is my affiliate link, so I do get a commission if you go through that and it doesn’t cost you any extra. In fact, I think you get a free trial at the moment, or you can go to mypropertytracker.com. So, they are some of the things that I recommend. In terms of receipts. I would definitely recommend using Dropbox. Let’s go ahead and go to dropbox.com. Dropbox is a program that syncs across multiple computers. But I would do is I would just go ahead and I would create – do I want to upgrade? No, I don’t. I would just go ahead – here, it’s easier to just use it on my desktop. I’d go ahead and I’d create a new folder and I just call it “Property 1”. And then, I would go ahead create months. So, January – or maybe let’s start with financial years, okay? So, 2016 to 2017, we’ll go ahead and do that. And then I would go ahead and put in the months. So, let’s start with July 2016. And so, you would then put all your receipts from July in there. All the receipts from August in the August one. So the thing, as far as I’m aware and obviously speak to your accountant, but in terms of receipts, it’s not so much something that you have to submit to the ATO, but it’s something that you need to have if they do call upon it. And so, I would have all the months in there for the financial year. I would store this on Dropbox because then it’s stored in the cloud, it’s very secure. I would also back this up to an external hard drive as well and I may even use a third backup source if I was required to by law, which I’m not sure whether you are or not. The benefit of this is at the end of the year, you can just take this spreadsheet, you can go ahead and go file and you can download it or you can go ahead and share it. There is a way to share it somewhere. Up here, you can go ahead and share this file. So I can share that with my accountant. In Dropbox, I can go ahead and I can find the folder and you can get a shared folder link for that and I can send my accountant that link. They can then download it straightaway and they’ve got everything they need. So super easy to share with my accountant. Super easy to do. So when it comes to what programs do I recommend for DIY property investors for tracking their finances, I definitely recommend Excel. If not, My Property Tracker – go to onproperty.com.au/tracker – they can do it for you. As well as Dropbox to save your receipts and then back them up to an external hard drive as well. That’s it. If you have any ideas, please leave them in the comments below this video on Youtube or go to onproperty.com.au/375 and there’s comments down there. If you’ve got software you absolutely love, if you’ve got something that makes your life 10 times easier, please share it with my. I’m not the expert on this, but I do this for my business, I find it really easy to do and really useful and I thought that it may help you guys as well. So that’s it for me today. If you’re interested in taking your property investing to the next level, you need a little bit of help to go ahead and buy that next property, then Ben the buyer’s agent, Ben Everingham who I got the pro tip from that I shared at the start, he is offering listeners and readers of On Property a free strategy session with him. So if you want to invest, but something is holding you back, you need some help, go ahead and get a free strategy session with Ben where you can talk through your situation. Talk through your next steps and if it’s a good fit, you guys can work together to purchase property so he can help you purchase property. So go to onproperty.com.au/session to look at the details for that free strategy session with Ben. I absolutely recommend it for anyone who’s considering a buyer’s agent or needs help going to purchase that next property. Something’s holding you back and you just need someone to help you. Ben is a great guy and I appreciate Ben offering those sessions to all the listeners and readers of On Property. So that is it for me today, guys. Until next time, stay positive.